AT TIME ZONE is great because it makes it easy to perform daylight saving time and time zone conversions in our queries. However, when using AT TIME ZONE for these types of conversions there are a couple key points to remember to ensure you are getting the correct results. Let’s look at an example. Thanks to reader Jeff Konicky for the inspiration for this post and allowing me to share it. This year, Daylight Savings Time kicks in at 2019-03-10 02:00:00 in Eastern Standard Time, meaning that the time zone switches from being 5 hours behind UTC to only 4 hours behind UTC. While that sounds great, the results above show it clearly didn’t work – both of those datetime2s are showing as already being in daylight saving time (offset of -04:00). The fallacy above is that I said our two datetime2’s are in UTC, but SQL Server doesn’t actually know this. The datetime2 (and datetime) datatype doesn’t allow for time zone offsets so SQL Server really doesn’t know what time zone the data is in. Using AT TIME ZONE on a datetime2 without offset information causes SQL Server to “…[assume] that [the datetime] is in the target time zone”. That explains why the two datetime2s above, intended to be in UTC, are actually seen as Eastern Daylight Time by SQL Server. 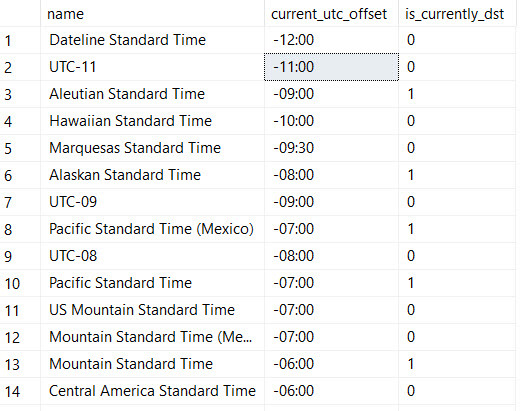 So how do we tell SQL Server that our data is in UTC so AT TIME ZONE functions like we want? Now we have the correct -05:00 and -04:00 offsets applied. Whenever working with datetime2 (or datetime) in SQL Server, you can’t assume SQL Server knows the time zone of your data. Your business logic may indicate that you store dates in UTC, but SQL Server has no way of knowing that without your code explicitly stating it using something like AT TIME ZONE ‘UTC’ or storing your data in the datetimeoffset datatype. Many people think daylight savings time was created to help align the hours that the sun is up with our waking hours so farmers and school children didn’t have to be outside in the dark. Or something like that. Well let me fill you in on a little secret – daylight savings time was actually created by a government works project to ensure that programmers could forever write tedious conditional logic in their date-based queries to handle the date time conversions surrounding time zones and daylight savings time. While these types of datetime conversions have historically been a pain, SQL Server 2016 introduced the AT TIME ZONE feature makes these types of conversions a breeze. See that +00:00 at the end of our value? That’s our time zone offset – it’s basically telling us how many hours and minutes away from UTC our date is stored in. With this offset in place, our UTC datetime isn’t encoded only by the variable name – it’s actually encoded in the data itself. Now that we have a well-defined UTC datetime, we can use AT TIME ZONE to easily convert our data to different time zones. The time portion of our datetime is now showing 7am with the offset indicating we are 4 hours behind UTC. Easy time zone conversions, yes! But What About Our Farmer Friends? So AT TIME ZONE makes it easy to convert between time zones – but how does it handle daylight savings time conversions? Well, on March 11, 2018 I lost an hour of my life when daylight savings time kicked in at 2am. Does AT TIME ZONE recognize this theft? YES! Say so long to conditional conditions that subtract an amount of time based on the date; AT TIME ZONE handles the switch to DST with ease as noted by the offset change from -05:00 to -04:00 . And just like that, programming for time zone and day light savings time logic just became a little easier. But I Don’t Live In The Eastern Standard Time Zone!